An Ariane 44L rocket lifted off from the Guiana Space Center in Kourou on Tuesday evening at 2302 GMT (7:02 EDT). 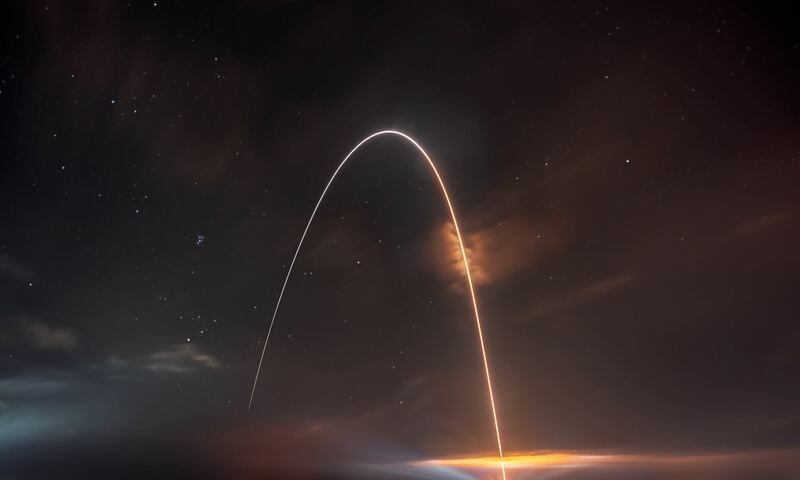 Twenty one minutes later the rocket deployed a Lockheed Martin-built NSS-7 telecommunications satellite which will provide Internet and data relay services to the Americas, Europe and Africa. The Hubble Space Telescope’s latest task is to track down elusive Pluto-like objects that lurk at the very edge of our Solar System – many of which seem to travel in pairs like Pluto and its moon Charon. These objects are classified as Kuiper Belt Objects (KBO) and can be found in a vast belt past Neptune. So far, 1% of KBOs have been found to be binary systems, a fact which puzzles astronomers. NASA’s Hubble Space Telescope is hot on the trail of an intriguing new class of solar system object that might be called a Pluto “mini-me” ? dim and fleeting objects that travel in pairs in the frigid, mysterious outer realm of the solar system called the Kuiper Belt. Pluto and its moon Charon and countless icy bodies known as KBOs inhabit a vast region of space called the Kuiper Belt. This ‘junkyard’ of material left over from the solar system’s formation extends from the orbit of Neptune out to 100 times as far as the Earth is from the Sun (which is about 93 million miles) and is the source of at least half of the short-period comets that whiz through our solar system. Only recently have astronomers found that a small percentage of KBOs are actually two objects orbiting around each other, called binaries. “More than one percent of the approximately 500 known KBOs are indeed binary: a puzzling fact for which many explanations will be proposed in what is going to be a very exciting and rapidly evolving field of research in the coming years,” says Veillet. Hubble was able to measure the total mass of the pair based on their mutual 570-day orbit (a technique Isaac Newton used 400 years ago to estimate the mass of our Moon). The ‘odd-couple’ 1998 WW31 together are about 5,000 (0.0002) times less massive than Pluto and Charon. Ever since the first KBO was discovered in 1992, astronomers have wondered how many KBOs may be binaries, but it was generally assumed that the observations would be too difficult for most telescopes. However, the insights to be gained from study of binary KBOs would be significant: measuring binary orbits provide estimates of KBO masses, and mutual eclipses of the binary allow astronomers to determine individual sizes and densities. Assuming some fraction of KBOs should be binary – just as has been discovered in the asteroid belt – astronomers eventually began to search for gravitationally entwined pairs of KBOs. Then, finally, exactly a year ago on April 16, 2001, Veillet and collaborators announced the first discovery of a binary KBO: 1998 WW31. Since then, astronomers have reported the discoveries of six more binary KBOs. “It’s amazing that something that seems so hard to do and takes many years to accomplish can then trigger an avalanche of discoveries,” says Veillet. Four of those discoveries were made with the Hubble Space Telescope: two were discovered with a program led by Michael Brown of the California Institute of Technology in Pasadena, CA, and two more with a program led by Keith Noll of the Space Telescope Science Institute in Baltimore, MD. The sensitivity and resolution of Hubble is ideal for studying binary KBOs because the objects are so faint and so close together. After a week of successful construction work, the 7-astronaut crew of the space shuttle Atlantis said their goodbyes to the crew of the International Space Station, closed the hatch, and undocked. During their time at the station, the crew of Atlantis installed $790 million in equipment, including a new girder and railcar which will support future expansion of the station. The shuttle is expected to land back in Florida on Friday. The crew ? Commander Mike Bloomfield, Pilot Steve Frick, Mission Specialists Ellen Ochoa, Rex Walheim, Lee Morin, Jerry Ross and Steve Smith ? was awakened at 2:44 a.m. to ?Somewhere Over the Rainbow,? performed by Bloomfield?s daughter. Atlantis? orbital maneuvering jets will be fired twice today. Once will be for scientists to look at the exhaust?s effects on radar echoes and effects of orbital kinetic energy on the ionosphere. The other firing will reduce the cross range for Friday?s backup landing opportunity in Florida. Walheim, Morin, Ross and Smith will continue to pack away equipment and supplies onboard the shuttle and prepare the cabin for landing. On board the International Space Station the Expedition 4 crew ? Commander Yury Onufrienko and Flight Engineers Dan Bursch and Carl Walz ? was awakened at 3 a.m. They are preparing for their next visitors, a Soyuz taxi crew slated to arrive April 27. Onufrienko, Walz and Bursch, will board the current Soyuz spacecraft and move it from its location on the Zarya docking port to the Pirs docking compartment on Saturday to make room for the replacement Soyuz. Astronauts Steven Smith and Rex Walheim spent a productive day in space on Sunday as they continued to extend the International Space Station. During their six and a half hour spacewalk, the astronauts released a clamp that held the Mobile Transporter to the newly installed S0 truss. They also hooked up a set of connectors which will allow the Canadarm 2 to move along the truss and help out future construction. Lately it seems that astronomers are discovering potentially harmful asteroids after they nearly miss our planet. This is because they’re coming from our planet’s “blind spot” – the space directly between the Earth and the Sun – and we can only see them after they pass. The European Space Agency is developing a new space-based observatory called Gaia, which will be able to see close to the Sun’s disk and detect many more of these previously unseen asteroids. Gaia is expected to launch in 2010. After installing their new railcar on the International Space Station yesterday, NASA wanted to take it for a spin. The railcar – which will be used in future phases of the station’s construction – rolled along the track for a few minutes but then it stalled. Controllers suspect the car drifted slightly in the low gravity causing its magnetic sensors to break contact with the aluminum rails. According to researchers from Cornell University, binary asteroids – where a small asteroid orbits a larger one – are actually pretty common in Earth crossing orbits. In fact, they think that gravitational interactions with the Earth might actually help to cause the arrangement. The researchers estimate that 16% of asteroids larger than 200 metres in diameter have a companion – so far they’ve found five using two of the world’s largest radio telescopes. Binary asteroids — two rocky objects orbiting about one another — appear to be common in Earth-crossing orbits, astronomers using the world’s two most powerful astronomical radar telescopes report. And it is probable, they say, that these double asteroid systems have been formed as a result of gravitational effects during close encounters with at least two of the inner planets, including Earth. Writing in a report published by the journalScience on its Science Express web site (April 11, 2002), the researchers estimate that about 16 percent of so-called near-Earth asteroids (NEAs) larger than 200 meters (219 yards) in diameter are likely to be binary systems, with about a three-to-one relative size of the two encircling bodies. To date, five such binary systems have been identified by radar, says lead researcher Jean-Luc Margot, an O.K. Earl postdoctoral fellow in the Division of Geological and Planetary Sciences at the California Institute of Technology. Margot, who at the time of the observations was a research associate in the planetary studies/radar group at the National Science Foundation’s (NSF) Arecibo Observatory in Puerto Rico (managed at Cornell University), says that theoretical and modeling results show the binary asteroids appear to be formed extremely close to Earth — within a distance equal to a few times the planet’s radius (6,378 kilometers or 3,963 miles). “The fact that one out of every six large NEAs is a binary and that they typically survive on the order of 10 million years, implies that these close encounters must happen frequently compared to the lifetime of the binary asteroids,” says Margot. The Science article, “Binary Asteroids in the Near-Earth Object Population,” is coauthored by Michael Nolan, research associate at Arecibo; Lance Benner, Steven Ostro, Raymond Jurgens, Jon Giorgini and Martin Slade at the Jet Propulsion Laboratory (JPL); and Donald Campbell, professor of astronomy at Cornell. The observations were made at the 70-meter Goldstone NASA tracking telescope in California and at Arecibo Observatory. NEAs are formed in the asteroid belt, between the orbits of Mars and Jupiter, and nudged by the gravitational attraction of nearby planets, largely Jupiter, into orbits that allow them to enter the Earth’s neighborhood. Most of the asteroids are the remnants of the initial agglomeration of the inner planets. Astronomers have long speculated about the existence of binary NEAs, based in part on impact craters on Earth. Of about 28 known terrestrial impact craters with diameters greater than 20 kilometers, at least three are double craters formed by impacts of objects about the same size as the newly discovered binaries. Astronomers also have noted the changes in brightness of reflected sunlight for some NEAs, indicating a double system was causing an eclipse or occultation of one by the other. In 2000, Margot and his co-researchers, using measurements from the Goldstone radar, found that a small, roughly 800-meter-diameter (half-a-mile) asteroid, 2000 DP107 (discovered only months before by a team from the Massachusetts Institute of Technology), was a binary system. Observations over eight days last October with the much more sensitive Arecibo telescope clearly established the physical characteristics of DP107’s two asteroids as well as their orbit about each other. The smaller object called the secondary, it was found, is about 300 meters (1,000 feet) in diameter and is orbiting the larger asteroid, the primary, every 42 hours at a distance of 2.6 kilometers (1.6 miles). The two asteroids appear to be locked in synchronous rotation, with the smaller always with the same face oriented to the larger. Since that observation, says Margot, four more binary NEAs have been discovered, all in Earth-crossing orbits and each with a main asteroid significantly larger than the smaller body. “The primary is rotating much faster than most NEAs in all five binaries that have been discovered,” says Cornell’s Campbell. The Science Express article speculates that the most likely way the binaries are created is by close encounters of asteroids with the inner planets Earth or Mars. Of the five binary NEAs discovered to date, none has an orbit that brings it as close to the sun as Venus or Mercury. NEAs, basically piles of rubble held together by gravity, are on trajectories that bring them within a few thousand miles of the planets, where tidal forces —- essentially the pull of gravity — can increase the spin rate of the asteroid, causing it to fly apart. The ejected rubble then reforms in orbit around the larger asteroid. “The asteroid is already rotating very quickly as it approaches the planet. A little extra boost from tidal forces can be enough to exceed its breakup limits, and it sheds mass. This mass can end up forming another object in orbit around the asteroid. Right now this seems the most likely explanation,” says Margot. Arecibo Observatory is operated by the National Astronomy and Ionosphere Center at Cornell under a cooperative agreement with the NSF. The research was supported by the NSF, with NASA providing additional support for the planetary radar program at Arecibo. One of the most exciting fields of research in astronomy is the search for extrasolar planets, and eventually the search for other Earth-like planets. So far more than 100 planets have been discovered, but none are remotely similar to our home. At a recent meeting of the Royal Astronomical Society, astronomers proposed criteria for searching for Earth-like planets, and even a few candidates. Unfortunately, the technology needed is still 15 years away. After its second day in space, Atlantis caught up, and docked with, the International Space Station. Its seven-astronaut crew are preparing to add the next major component to the station: a 13.4 metre truss which will serve as a backbone for new modules to be installed in future missions. The first spacewalk is scheduled for tomorrow, when astronauts Steve Smith and Rex Walheim will exit the shuttle and help make the first connections between the truss and the station. Three additional spacewalks are planned. Atlantis gently docked with the International Space Station this morning over southern China, setting the stage for the installation of a 13 1/2 ton truss structure to the complex tomorrow and the ultimate expansion of the ISS to the length of a football field. Commander Mike Bloomfield guided Atlantis to a linkup with the forward docking port of the station’s Destiny Laboratory at 11:05 a.m. Central time as the two vehicles sailed at an altitude of 240 statute miles. The docking culminated a textbook rendezvous executed by Bloomfield and Pilot Steve Frick. As Atlantis docked, Expedition Four Flight Engineer Dan Bursch, a Navy Captain, rang the ISS ship?s bell to greet the arriving shuttle crew. About two hours later, at 1:07 p.m. Central time as the two craft flew over New Zealand, hatches swung open between Atlantis and the station, and the ten crew members greeted one another inside Destiny, marking the arrival of the first visitors for Expedition Four Commander Yury Onufrienko, Flight Engineer Carl Walz and Bursch since they entered the ISS in December for the start of their six-month mission. After a safety briefing for the shuttle astronauts by Onufrienko, the two crews began to transfer gear for the first spacewalk tomorrow by Steve Smith and Rex Walheim as well as experiments to be housed in Destiny. Ellen Ochoa joined Bursch to brush up on procedures for the use of the station?s Canadarm2 robotic arm tomorrow which will be employed to grapple and unberth the 13 ? ton S0 (S-Zero) Truss from Atlantis? cargo bay for mating to a capture device at the top of Destiny. Smith, Walheim, Jerry Ross and Lee Morin will conduct four spacewalks to electrically and structurally mate the S-Zero to Destiny over the next week. Ochoa maneuvered the arm and verified it is in good working order to support the S-Zero operations on Thursday. Smith and Walheim set up all the equipment in the Quest Airlock on the ISS from which they will mount the first of the four spacewalks to deploy two of the four mounting struts to Destiny and to bring power to the new truss from the U.S. Laboratory. Ochoa is scheduled to grapple the S-Zero around 5 a.m. Central time with the first spacewalk set to get underway around 10 a.m.
Atlantis and the ISS are in excellent shape, orbiting the Earth every ninety minutes in an orbit inclined 51.6 degrees to either side of the Equator. The two crews began an eight-hour sleep period at 7:44 Central time this evening and will be awakened at 3:44 Thursday morning for the fourth day of the mission.